With Brexit in 2019, Pet Travel Scheme rules are changing even if you have an existing passport. The following is the advice we have been given and we will update this as and when we receive more information. 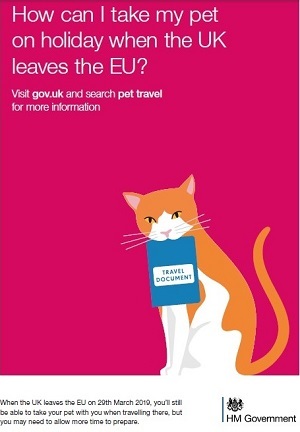 Visit gov.uk and search pet travel for more up to date information. If pet owners are planning to travel after 29 March 2019 the Government will recommend they contact their vet at least four months in advance to check what they need to do. Those wishing to travel to the EU on 30 March 2019, for example, should discuss requirements with their vet as soon as possible and by 28 November 2018 at the latest.